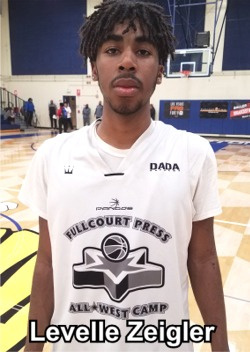 As the April NCAA D-I Spring live period is rapidly approaching, most of SoCal’s top seniors (2018 class) are off the board and very few quality available prospects remain. The recent Fullcourt Press Diamond in Rough Senior Showcase on Friday March 16th at Fullerton College (CA) featured 90+ top unsigned seniors from Southern and Northern California as well as Nevada in front of several NCAA D2, D3, NAIA and JC coaches in attendance as well as many more watching the games on the Baller.tv live-stream. Besides myself, other scouts and video outlets in the building included Ronnie Flores (Ball is Life), Etop Udo-Ema (Dunk News), Jerina Madayag (Premier Ball), Alex Carmon (Beach City Hoops), Roy White (West Coast Hoops) and Ed Sandoval (MOSHoops.com). Listed below are the top prospects participating in the event. Very versatile lefty can play 3 positions on the floor (WF, WG & PF) and has the length to get to the cup and finish off the dribble as well as the perimeter range to bury 3-point bombs. Good student (3.2 GPA/980 SAT). Nevada and UC-Irvine among the increasing number of schools showing interest. Scored 16 points (2 threes) in his showcase game. Bouncy WG with lethal 3-point range is a Florida native that transferred to Pasadena for his senior HS season. Very good student (3.8 GPA) scored event-high 25 points (3 threes) in his showcase game. Strong and explosive wing with improved scoring touch. Very good student (3.5 GPA/1150 SAT) had his senior season cut short in January when his CIF high school eligibility expired. Scored 16 points (2 threes) in his showcase game. One of the surprises of the event. Very skilled combo-guard is a dangerous perimeter scorer. Solid student (2.8 GPA/930 SAT) is also a very deceptive athlete that can finish above the rim. Scored 20 points (2 threes) in his showcase game. Long PF with nice ability to face-up, catch and pop. 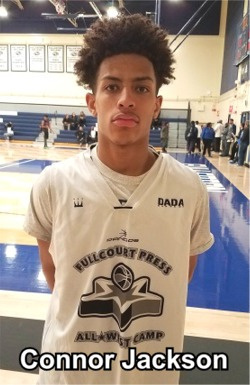 Solid student (2.8 GPA/1110 SAT) needs to add weight and strength but the upside is there to be a legit Big West, WCC and Big Sky 2018 recruiting target this spring. Athletic and agile forward is just scratching the surface of his MM-HM potential. Very good rebounder and finisher in transition. Big wing is a very good slashing scorer with improved jump shot. Will re-classify to 2019 (doing a post-grad year at prep school) and will be part of San Jose State’s 2019 recruiting class. Has given a verbal to the Spartans. Scored 11 points (3 threes) in his showcase game. Young HS senior SG with soft touch and long range on jump-shot. Solid student (3.0 GPA) is nowhere close to peaking physically yet. Scored 12 points (3 threes) in his showcase game. Late-blooming combo-guard is the younger brother of St. John’s PG Marcus LoVett. Athletic slashing scorer can also knock down perimeter shots. 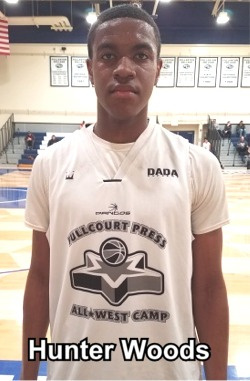 Senior sleeper is a very crafty scorer with deep range on jump shot. Excellent on-ball defender is also a good student (3.2 GPA/1090 SAT). Scored 15 points (3 threes) in his showcase game. Crafty scoring combo-guard can put points on the board. Good student (3.3 GPA/2500 SAT). Scored 11 points in his showcase game. Australian import is a versatile guard that can make plays for himself as well as his teammates off the dribble. Good student (3.2 GPA/1510 SAT). 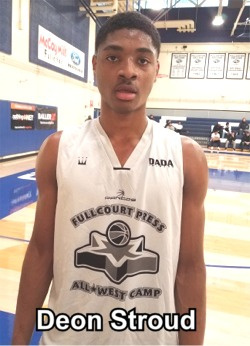 Well-built wing has nice scoring instincts and is a good student (3.2 GPA/980 SAT). Scored 14 points (2 threes) in his showcase game. 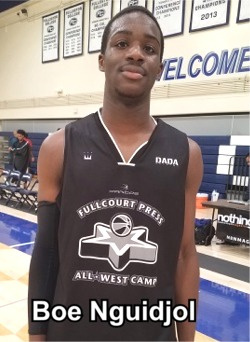 Burly but very bouncy undersized forward is a lot like older brother Kristaan Johnson (UCLA). Crafty scorer in paint, has range to the 3-point arc and is an above-average rebounder for size. Dad is former Crenshaw HS/UCLA/NBA star Marques Johnson. Scored 10 points (2 threes) in his showcase game. Underrated Trinity League combo-guard that can knock down “threes”. Good student (3.0 GPA/20 ACT) had 12 points (4 threes) in his showcase game. Massive center prospect takes up space in the paint and has a decent scoring touch near cup. One-time UTEP commit is an excellent student (4.0 GPA/1620 SAT). Strong wing forward can finish through contact. Good student too (3.0 GPA/1190 SAT/22 ACT). Scored 11 points in his showcase game. WF with accurate shooting touch, size and very good academic marks (3.4 GPA/1220 SAT/26 ACT). Originally from Westlake HS (Thousand Oaks CA). Physical rebounder and defender with solid academics (3.0 GPA/980 SAT). Tough and quick PG is hard to stop off the bounce and is a pesk defensively. Savvy point guard is a terrific passer with a smooth pull-up jump shot. Good student (3.2 GPA/1250 SAT). Sturdy WG with nice perimeter range. Good student (3.4 GPA/1040 SAT) just had a recent offer from Cal State East Bay. High-scoring combo-guard had 17 points in his showcase game. Sharpshooting off-guard is on track to be a qualifier (2.8 GPA/980 SAT).